Each One Bedroom unit at the Village Inn offers an efficient mountain lodging experience designed primarily for couples and small families ready to settle in after a great day outdoors. The main living area is comfy with the primary sleeping space in a separate bedroom. 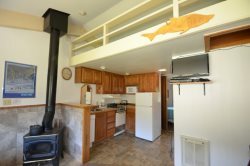 This One Bedroom+ unit includes a kitchen, TV, main bedroom with half bathroom, hallway sleeping alcove, full bathroom with tub/shower, small deck, and exterior storage for skis. The full kitchen offers appliances and basic cookware, serving ware, and utensils. Unit 41 is accessed via a few steps up from the parking area to the ground floor hallway. The unit's main window offers a southern view toward the White Pass alpine ski area and beyond.